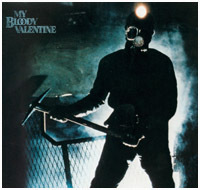 In the late months of 1980, Director George Mihalka worked feverishly to meet a February '81 release date for his then current project: My Bloody Valentine, easily one of the best slashers to emerge from the early '80s. Now three decades later, a hardworking Mihalka has helmed over two dozen features, a variety of international co-productions, as well as assorted TV episodes and miniseries. Also Vice President of the Directors Guild of Canada, Mihalka was generous enough to sit down with The Terror Trap and provide some insight into the frenzied production that was My Bloody Valentine, a professional craftsman's journey full of nostalgic horror and gory fascination. 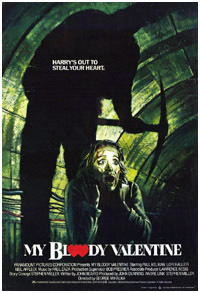 The Terror Trap: Do you want to take us through how My Bloody Valentine came your way? George Mihalka: It was all by accident, actually. There was this little teen comedy that I directed called Pick-up Summer that did some very good business. It was originally titled Pinball Summer. It was a small independent film but it performed well in Canada and the United States. 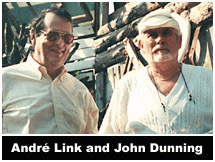 And on the strength of that, John Dunning and André Link's company Cinépix asked me to develop a comedy for them. TT: Cinépix boasted a great roster. They had produced several early features from David Cronenberg such as Shivers and Rabid. They had also done William Fruet's feisty Death Weekend. GM: Yes, they were a good place to be. So in the process, we started working on a comedy which actually ended up becoming something called Young Doctors in Love some time later. We called it Stitches. GM: Right, it came out a few years later. I was working on Stitches with a few people from National Lampoon...Michel Choquette, who used to be the editor for Lampoon at the time, and his partner Mike Paseornek. We were working on the script but unfortunately, the screenplay wasn't ready. In Canada at the time, they had all these tax shelters and so on to finance films. And you had to have it ready at a certain time. Due to other engagements that Michel had, we couldn't get the script ready in time to the liking of John and André. And John Dunning said, "Well look, I have an outline from Stephen Miller for a horror picture that I'd like to do." He asked me if I'd be interested in maybe doing that as a first one with Cinépix and the second could be done later. Being young at the time...wanting to make a career in directing, I said sure. I looked at the outline and it seemed pretty interesting compared to a lot of the other slashers that were going on at the time. TT: What was next in the process? GM: Dunning told me he had a writer in mind named John Beaird. Beaird was willing to come up from Los Angeles and work with me on it. The only thing we had to do was be ready to shoot in a couple of months. TT: So shooting on MBV began in mid-September 1980? GM: That's right. We went up to Nova Scotia at that time. Basically, we had five or six weeks to write the script. We had to go through scene by scene so people could start prepping before we actually even had a full script out. Thankfully, Beaird was a very fast and professional writer. He was busy writing, I was busy looking at it and saying, "Yeah we can do that....no we can't do that...that won't fit into the budget," etc. TT: How much of the script would have been driven by the recent success of Friday the 13th? By the inevitable rush of Friday the 13th Part 2? GM: No, the major driving force was the fact that Paramount and Frank Mancuso were willing to do a pick up and a national distribution...as long as we could get it out for Valentine's Day. With the kind of technology we had to use in those days, it was an incredible challenge. GM: We had to be ready to open in 1,200 theaters across North America...it was one of the largest openings. TT: It's a crazy timeline. GM: It was...but we were young. (Laughs.) If you can't meet a challenge when you're young, when are you gonna do it? GM: One of the reasons that we were able to do it is that we didn't know any better. We just figured we were good and smart enough technicians...and we were good enough organizers and filmmakers. Just because everybody else thought it was really tight and almost impossible, that just put more fire underneath us. TT: For a slasher from that era, MBV is a very handsome looking film and it benefits from a great pace and careful structure. That's probably why fans our age remember it so well from our youth. TT: As so often is the case with slashers, if you pick two or three blonde gals that look even vaguely the same, you might not end up remembering who's who until you get to the final girl. TT: Was MBV a project that you believed in or was it a way to get your foot in the door? GM: (Laughs.) So we had Lori Hallier, you know? GM: One of the things that both John Beaird and I wanted to do (and we were certainly supported by John Dunning and André Link), was that we wanted to take it out of the suburban bungalow context. We wanted to set this in some place where there is a slight hint of social consciousness. This was really the first film in that era where teenagers are actually talking about the fact that there's no future left. GM: There's no jobs, there's no future. Not a lot of hope. It was, in a strange way, the first of a Generation X mentality. I think that's what may still resonate after all these years. TT: That's a good point. Do you recall what kinds of horror films prior to that were in your mind? GM: Well, basically we looked at quite a few at the time. Whichever ones were available...of course there was Halloween and there was Friday the 13th. One of the things that I really liked in terms of atmosphere...some people may think it's a horror film, some people don't...is Polanski's Macbeth. TT: Interesting you mention Macbeth. Because MBV has a unique dankness for a slasher film. And you can't beat Macbeth as a neverending source for any kind of dreariness. GM: Yes. And the town and the atmosphere and the mine are all part of the characters. If you look at films of that era, this was really one of the first in which the use of rain, atmosphere and smoke...was very prevalent. TT: We've noticed details (like the smoke) which make the movie really nuanced and thoughtful. The flashback scene with Harry Warden on his bloody night of revenge (puddles, mist, shadows)...it's a great showcase for these kinds of little things. GM: Remember, at the time...the fastest film stock available in those days was Kodak 5247, I believe, and it had a speed index of 125 ASA. Because of the fact that we had to work so fast, we actually had to shoot in a real mine. Very few of those scenes are actually shot in a studio. TT: How was the location chosen? GM: Basically while John was busy writing, I was already traveling in the mining areas of Canada and we happened to find this mine which was now closed and they were thinking of turning it into a mining museum. And so that's the one we chose. 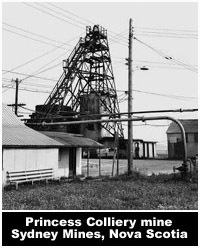 It was the Princess Colliery mine located in Sydney Mines on Cape Breton. A small town with a population of about 8,000. TT: And the Princess mine had been closed down since 1975, correct? GM: Yes, so when we got there it had only been closed for a few years. And everything was still in working order. I should mention there was a great mining museum in Glase Bay that we also looked at. But the problem with the Glase mine was that it was already way too touristy...too pretty for a mine. TT: So that was another location you had considered? GM: Right. It was about 20 or 30 miles from Sydney. What was interesting about Sydney Mines was that the exterior was still a dreary, cold and dusty area...aside from one little souvenir shack. And there were no other buildings around it so it looked like it was totally in the middle of nowhere. There's a funny anecdote about that too. GM: Once the townspeople found out that we were actually going to shoot there, they all decided that we couldn't simply shoot the mine the way it looked...and the town went out and spent $50,000 and repainted the whole thing. TT: Yikes! So the pithead looked all new and presentable? TT: That's a great story. GM: When we showed up, we just said, "Oh my God!" Actually, we started out already behind budget on the day we arrived because we had to spend $75,000 to return it back to its original state. [The estimated budget for MBV was around $2 million]. TT: Did the town fully understand (based on the fact that they had gussied it up) that you were coming to film a horror film? GM: Yes they did. Don't forget, it was 25 years ago and it was a small town. Even now, it's a strange thing...people are much more savvy about how films are made these days...and yet you go to a small town somewhere and most people are shocked to find out that an hour and a half of film takes months to do. GM: Oh, they loved us. They just thought it was great. They were the most cooperative, wonderful people in the world. It's just that we couldn't now ask them to spend money after they lovingly and innocently spent all that money cleaning it up. We couldn't exactly say "Well, sorry...we're leaving unless you now spend money to destroy everything you just did." TT: Is it true that the decorations throughout the town (the red hearts, etc.) were done by the townspeople? Or were they done by the production crew? GM: Well, we made them all. The town was very happy to actually help us put them up. Storeowners and so on were perfectly happy to stick them up. People were extremely cooperative. I think that's what sets the film apart. You have those kinds of shots that most of these films, especially with similar budgets, never had. TT: Absolutely. Let's talk about the cast. You had used several of them in Pick-up Summer (Udy, Marotte, Kovacs and Stein). But aside from Don Francks, for many of them it was basically their first film experience. Was it a conscious decision to hire some unknowns to give a freshness to MBV? GM: Yes it was. There were two things going on there. One, of course, it was a Canadian film and we were going to use Canadians. Two, the reality was...as John Dunning has always said...a horror film is not necessarily a film where people go to see the "name" actor. The amount of money that you would put out on a "name" just so they could get splattered against the wall...as opposed to an unknown who gets splattered against the wall...people are going to see the films for the splatter and not for the name. These discussions were going on all the time with the producers and so on. John in his wisdom decided he would rather put the money into the special effects, which at the time were the absolute state-of-the-art. We could probably not have afforded that if we went out and got a lot of name actors. TT: And yet horror films are routinely criticized for poor acting. The fact that an unknown cast does so well is another big benefit to MBV. GM: Usually what happens is that most of the time, horror films tend to be a first step act. One of the reasons for that (of course) is that once you've been around the business long enough, there's a certain snobbish factor unless you happen to become one of the "masters." That same principle applies to actors also. GM: We tried to at least find young and inexperienced actors who tended to have a little potential. Not all of them did...but we tried to make sure that no one was embarrassing. TT: Hallier is first-rate. Who else do you think stood out? GM: I think Helene Udy did very well as Sylvia. The actor who I always thought was the absolute best of the bunch in terms of natural instinct was Tom Kovacs...who disappeared off the face of the earth. I believe Kovacs went out and got himself a guitar and traveled Canada playing music. And unfortunately, I've never heard of him since. He seemed to be the one who had the most internal talent (from the guys). Rob Stein also did great as Sylvia's boyfriend John. Rob is now some serious big wig in the advertising business in New York from what I understand. Helene Udy was always very good and she's still carrying on, doing some work. GM: Well, Cynthia Dale has become a bit of a national star in Canada. She regularly stars or is a lead in Canadian television series....and is basically a very, very highly respected actress in Toronto. TT: Do you keep in touch with anyone? GM: I saw Lori Hallier about six months ago and she looks fabulous. She looks exactly the same. She lives in Toronto also. She's very, very attractive as always. A very talented lady. TT: That's why The Terror Trap exists. For faces like that...which are clearly pretty and beautiful and yet unique. They're not so perfect that you're not going to remember them because they all look the same. That's what 1981 horror exemplifies. GM: At the time, the formula was to take as many of the cliches...all-American suburban faces...and absolutely inter-changeable. So that's what we tried to do different. That's why we made the "big fat guy" (Keith Knight) one of the noblest guys. As opposed to the good-looking square-jawed football captain. TT: They're all attractive in their own way, probably because they're "real." GM: That's what we tried to do. I don't know if we succeeded fully or not but at least we tried to make them real and we tried to make their reality real. I think the biggest stretch in the whole story arc is girls actually wanting to go down into the mine! GM: But that's one of the pillars of any kind of horror film...is that people end up going someplace where nobody in their right mind would normally go. TT: In the name of "fun." GM: In the name of fun, right. Or it's the same as "Ooh, let me see...I'm barefoot and wearing a flimsy negligee...there's a serial killer out on the loose and I'm hearing some noise in the basement. Why should I call the police when I can just go down there holding a candle..." (Laughs.) It's part of the convention, I think. TT: You've said you felt that the characterizations and the love story and the drama...all that stuff separated MBV from other typical slashers of the time. GM: That was absolutely the intention. I guess if we didn't have the problems of censorship and ratings...it would probably have been one of the all-time grossing films in the genre. Unfortunately, with the cuts MBV had to endure, there wasn't much blood left. And yet strangely enough, the impression is still there. Which I think is a credit to all the incredibly talented film actors that worked on it. TT: Our feeling is that you can really feel that the blood was there. So the shoot lasted about seven weeks? TT: What's the most difficult thing you remember about it? GM: Well, the most difficult thing of course, was working in the real mine. We were working 900 meters under ground. That's 2,700 feet. TT: Wow. Did you have air problems? GM: Well, yes...there were air problems. And those mine cages...you saw the elevators...we shot them. You know, when people get in and out of the elevators to go down in the mine? GM: Those were the real elevators that would take you down to the Level. And it took about fifteen minutes to get down to the bottom. There were two of them and you could only put about twelve people in them. TT: Did anyone have claustrophobia? GM: Some people did and we had to deal with that also. And trust me, even if you didn't have claustrophobia when you started, you certainly started getting it eventually. So basically what would happen is it would take almost an hour to get everybody down into the mine. If your daytime call is at 7:00 in the morning, by the time you actually assembled your crew ready to work, it was already 8:00. The other thing to go back to...the film stock...we were using the fastest film stock available but that had to get pushed by two stops which could only be done in New York at the time. Another problem is that methane gas is a byproduct of coal. Now when methane gas builds up, it becomes very explosive. The only lighting equipment we were allowed to use was safety lighting equipment because there were no sparks. The brightest bulbs you could use with no-spark equipment was 50 watts. That's smaller than most people have in their kitchen. TT: That's pretty dim. And so because of the dangers of lighting down there, were there advisory crewpeople made up of Sydney miners and the like? GM: Yes, they helped. Our director of photography, Rodney Gibbons, actually had one of the first (and almost a prototype) digital light meters because instead of measuring foot candles of light in the 100s, we were measuring them in the ones and the twos. Regular light meters would just not be able to differentiate between two-foot candles and four-foot candles. In this, it was the difference between a key light and a fill light. And since you're doing a "murder mystery" and horror and suspense, you need to play with shadows and dark and light. So that part of lighting the sets down underneath was very, very complicated. TT: That must be one of the unfortunate aspects of making a horror film. Lighting always seems to be problematic when you take on various location shoots. GM: Yeah. Now of course, how do you shoot in the dark when film needs light? So you have to convey the impression that it's dark yet at the same time be able to see. TT: A good example of using lighting in MBV to the best effect is when Dale gets killed. GM: Yeah...that's when she gets the pick ax in the stomach? TT: That's right...because the miner basically appears out of nowhere. It's not only skillful timing but also careful lighting. Great scene. GM: Oh, another thing...we had to send people up an hour before lunch arrived so that they could make their lunch hours without going into overtime. An hour lunch would take three hours. So basically, we had to shoot a regular day of shooting but we ended up with only 3-4 hours left because of all the ups and downs with the elevators. TT: Were there any problems with either the elevators or the mancar train? GM: No, we really didn't have any problems with them. We made sure that things were in very good working condition. So then what happened is that some of the special effects for scenes down in the mine...you know, with special effects you can never ever predict how long it's gonna take to get ready. It's ready when it's ready. And then if it doesn't look good, you have to fix it up again because you don't know how good it's going to look until you're finished doing it.